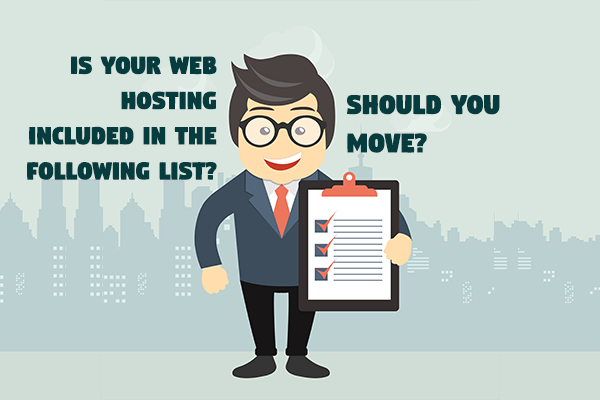 Is Your Web Hosting Included In The Following List? Should You Move? Comments Off on Is Your Web Hosting Included In The Following List? Should You Move? Should you change web hosts? Let me try to make it easy. I’ll give you a list. Should you change web hosts? I’ll be honest. I learned a long time ago that if you have nothing nice to say, you just shut up. And it’s a rule that I follow – most of the time. But every now and then, I write a negative post. I think this site has 4 and this makes it five – out of almost 1200. So like I said, I’m not normally negative. But the reality is that I keep getting calls, emails, Facebook messages and even Clarity calls where people complain to me about their web host. And you know what they all have in common? One single parent company owns the majority of crappy hosts listed below. They’re called EIG. Now, I know that at least one of these, BlueHost, gets a ton of positive press from folks like Automattic (who received funding from EIG), and known personalities (who make a majority of their revenue from them). I get it. Everyone has an angle. Even me. I get affiliate revenue for these links. But I don’t get millions. And the revenue I get from my recommendations is less than 5% of my total yearly revenue. So that should hopefully contextualize these links. Additionally, I recommend many – based on what you need, not based on what makes me the most money. What I’m saying is that I can normally find a good reason that a host exists for a particular kind of client – and making that recommendation feels different than simply pushing a single solution to everyone, in order to maximize a particular outcome. What I can tell you is that if you have one of the hosts below, you should know they’re all part of the same company. Switching from one to another may not help you much. This list was taken from the most complete list I could find online. Is there a particular feature that they don’t have? Like, will their backups easily corrupt – leaving you high and dry? Or is there a problem with their data centers – so that they go down and leave you hosed for days? While these things have been true for these companies, that’s not what I’m talking about. Because here’s a bit of truth you need to own – every host will have its challenges. So there is no perfect company and no perfect hosting product. But that’s not why I’m suggesting you may want to switch. And frankly, I don’t mind if you don’t switch – assuming everything is perfect for you right now. But you have to be warned. The reason I’m letting you know about this relationship and dynamic is because you’re a person and your site matters. A company whose growth strategy is acquisitions, normally looks at numbers rather than individuals. Only you can determine if EIG is treating you in a way that makes sense. And if you realize that you or your site doesn’t matter – like in the middle of a support request – it might be too late.